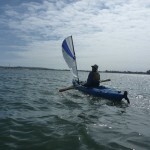 Recently, Patti and I have been developing and refining an accessory headsail for the Kayaksailor. For those new to sailing terminology, a headsail on a boat is commonly referred to as a jib or a genoa (named for the city in Italy). The main difference between a jib and a genoa or “jenny”, is the overall sail size and it’s position in relation to the main sail. A genoa is larger than a jib and overlaps the mast with it’s leech when close hauled. Genoas are typically used to maximize overall sail area and are commonly seen in use on sailboats in light winds. They often make boats faster and more powerful not only because of the increased overall sail area but because of the synergistic relationship between the two sails. 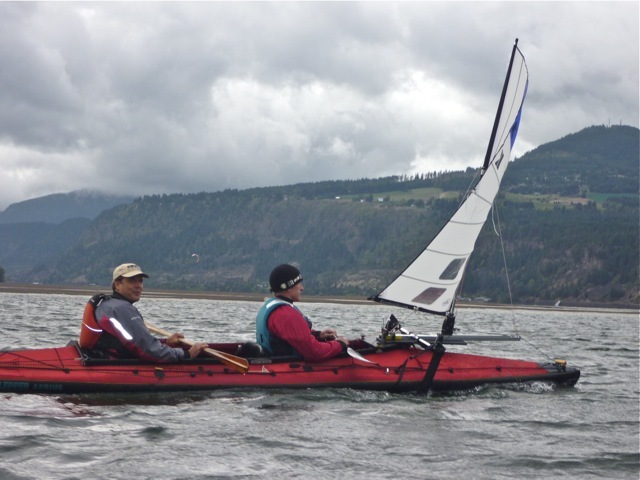 When pointing close to the wind a properly designed and trimmed head sail allows the main sail to work at a higher angle to the wind without stalling, making reaches to windward more effective. Another nice feature of head sails, especially genoas, is their low aspect ratio shape. The center of effort is low making them powerful with minimal heeling making it easy to control from the cockpit. Our headsail project is something that has been in the works for a while now. 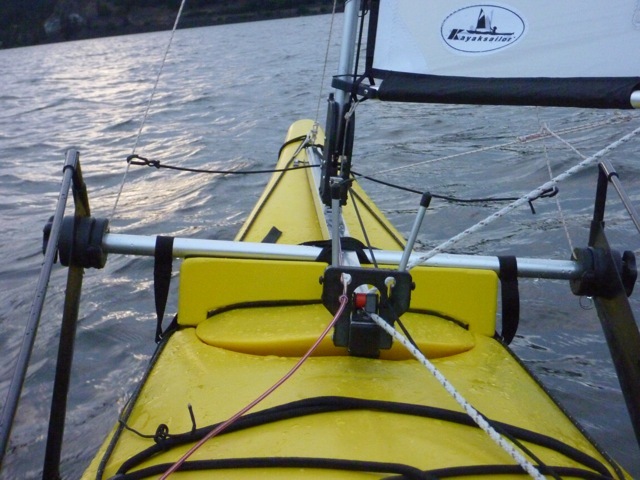 With the Columbia Gorge springtime winds kicking in, research and development is in full swing. The Columbia River Gorge is North America’s natural wind tunnel and dishes out some truly amazing winds. We get everything from two to thirty plus knots (and often higher!) on a regular basis, daily depending on the location, making this an ideal location for extreme sailing and putting prototypes through their paces. This little headsail has us pretty excited! We’ve made several prototypes to determine an effective size and shape and are currently working on refining the foil profiles for maximum efficiency. If you haven’t done so already, please consider subscribing to this blog, I am happy to post new developments. While sailing a friends kayak the other day, I discovered something very cool. His rig was mounted a bit close to me and I found my paddle blade knocking into the leeboard control rods every now and again. It wasn’t a big deal until I slid the paddle blade between the control rod and the gunwale on one particular forward stroke and it took an awkward maneuver to remove the trapped paddle blade. Now for the cool part, I sat there in the cockpit pondering the situation when it hit me, attach the control rod from the underside of the leeboard head! This effectively lowers the leeboard control rods and allows them to run flush against the hull. They are now completely out of the way. Wow, sometimes the answers are so simple. I love it! The only thing that takes a little getting used to is that the leeboard controls are reversed, meaning to lower the leeboard, one must now push on the control rod instead of pulling on it. I really like this new rigging technique and urge you to give it a try. Creativity is something that we all have. This precious gift is little used by some and more highly developed in others. 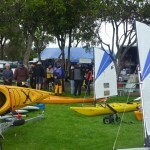 Kayak-sailors are quite creative, so are young children for that matter. Maybe this explains our immaturity, always wanting to go paddle-sailing instead of doing chores. Kidding aside, OK maybe I’m not kidding, I’m always amazed at how creative and clever people are when it comes to developing mounting systems for their rigs. People enjoy creating their own mounts. Whether for aesthetics, functionality, or both, the variety of systems is truly impressive. 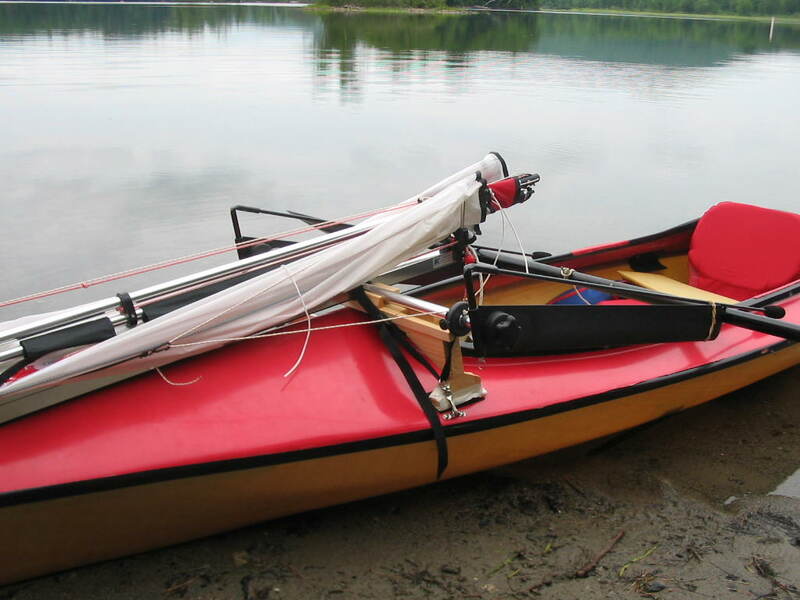 The Kayaksailor fits many boats right out of the box, just strap it on and you are good to go, but some boats can use a little help. Interesting foredeck shapes, prominent hatch covers, fishing gear, tall cockpit coamings, are all possible reasons why one would build a custom mount. Probably the most common mounting aid is the cross tube block. They are constructed from a variety of materials but most often from high density foam or wood. Cross tube blocks are typically used to help secure the rig on a peaked or scooped (concave surface from bow to cockpit) foredeck, but are also often used to raise the rig in order to clear deck gear or hatch covers. 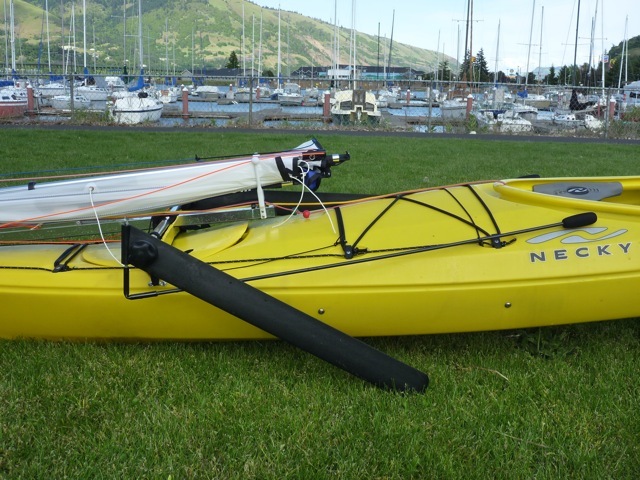 They can be used to level a rig or to raise the aft end of a rig to help open space beneath the boom for increased paddle efficiency when using large faced paddle blades. The yellow one above I made myself from a small scrap piece of 2×4 pine that was laying around the garage. The bottom shape was determined by bending a wire coat hanger over the top of the foredeck. Using this wire as a template, a line was drawn on the side of the block and a jig saw was used to cut the bottom shape. The top has a groove, made by a router, for the cross tube to sit in. A Velcro strap could have been used instead to hold the cross tube in place. A little sand paper and some yellow paint gave it a nice finish that matched the boat. Check out these beautiful mounting blocks made by Timothy Dunlap in Maryland. He attached the front block from below. 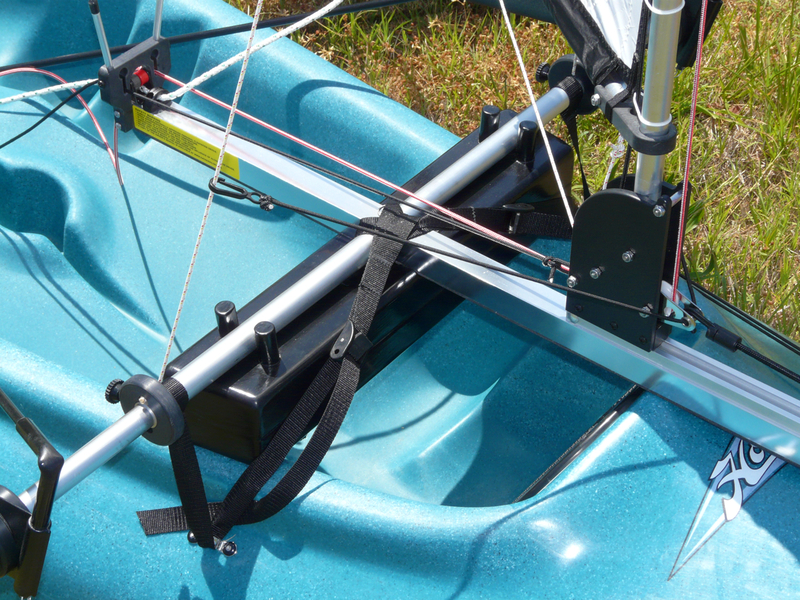 Some Kayaksailor enthusiasts like to make custom mounting brackets for their rig. Below, is a beautiful example of this style of mount made by Kimo Hogan in Calfornia for his Wilderness Systems Tarpon 12. The cross tube is held in place with an aluminum cap and machine screws, eliminating the need for cam-lock buckles and cinch straps. These brackets are made from machined aluminum, but I have seen some made from both wood and plastic. The front of the main body tube can also be held in a bracket. 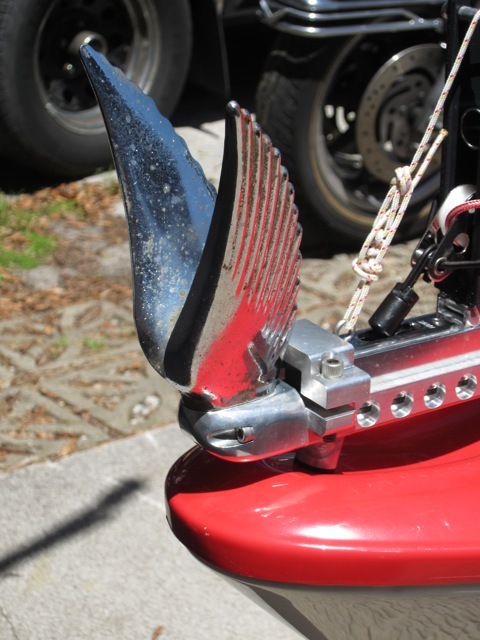 Check out this extremely cool front bracket decorated with wings that came off a 1937 Hudson Teraplane. Now that’s super Creative! 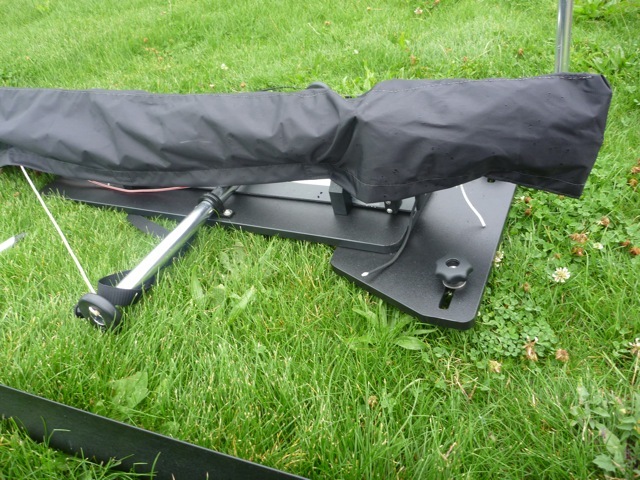 Custom mounts can also be made for folding craft. Here is a nice example of a clean mounting system for a Folbot Aleut, made by Gary G. from Massachusetts. 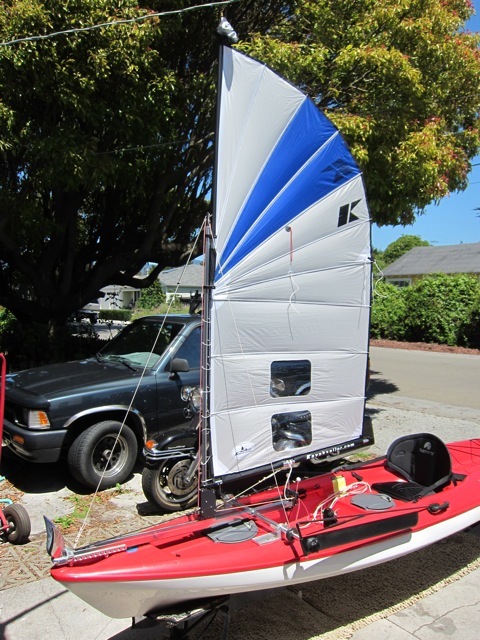 He uses a longitudinal support to keep the rig supported slightly above the foredeck. 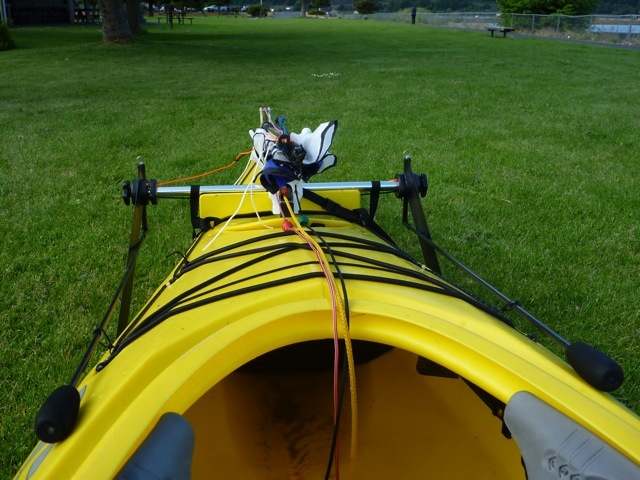 The rig is held to the support with Velcro and D-ring patches are used instead of pad-eyes for securing the mounting straps to the hull. Below is a very clever mount for a folder that Gerald Grace from Klepper America developed for securing the rig to the forward cockpit coaming of the Klepper. It’s unique cantilever design definitely shows thought and creativity. Seeing creativity in action is truly inspiring, and these are just a very small sample of the cool mounts people have come up with. 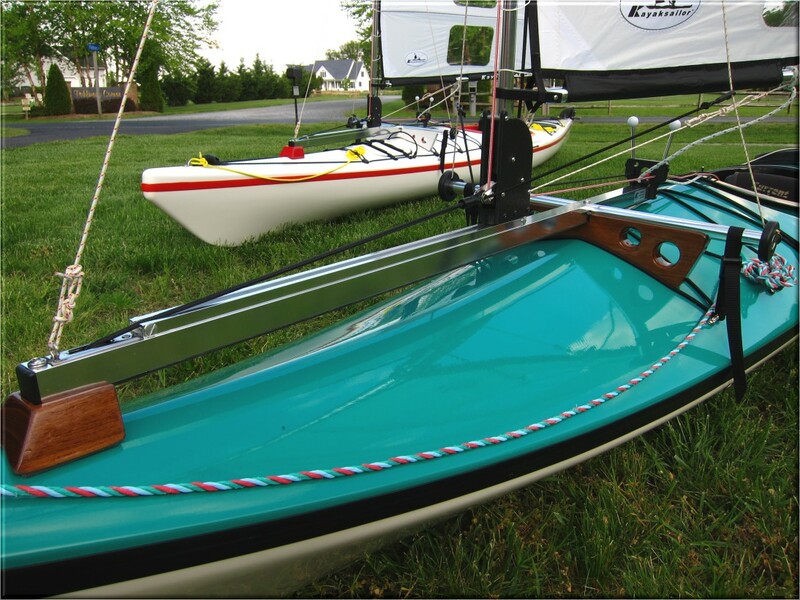 Now that your play instinct is stimulated, imagine yourself creating a custom mount for your own boat. Picture it ….What materials would you use?.. What would it look like?.. When you finish making it, send a photo or two. We would love to see it! Winter sailing here in Oregon is somewhat limited due to the cold. Even in dry suits it can be chilly. So, I decided to put together a short video to remind us of summer sailing. 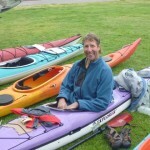 This movie shows Patti, myself and Mark Hall from Delta Kayaks, performing sea trials with the Kayaksailor 1.4m² and Mark’s own Delta 15.5. We spent a glorious afternoon filming last summer at Pitt Lake near Mark’s home in Vancouver, British Columbia. There is something about sailing near large mountains that really appeals to me. Perhaps it comes from spending a lifetime of sailing in places that were, let’s say….. geologically compromised. 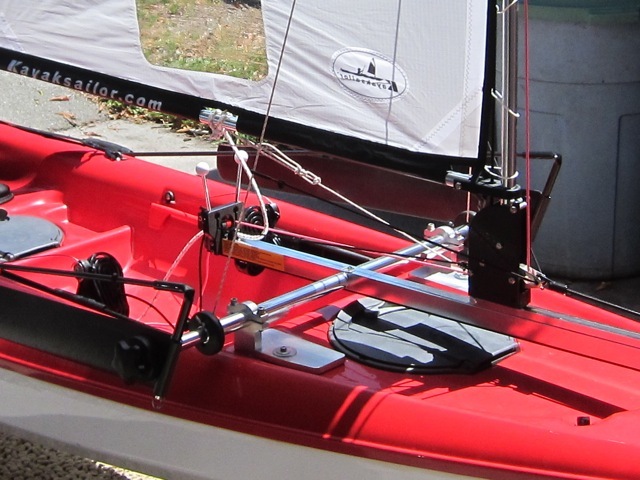 As you probably already know from watching our instructional videos, we recommend attaching the rig with the under-the-hull strap and some packaging tape for doing the sea trials. You can see the tape and strap in some of the shots. The sailing was spectacular, what a nice hull/sail combination. The boat is comfortable, stable and maneuverable, a real treat to sail. She is very fast for her size and seems to move through the water effortlessly. There is also that prominent eye-catching sheer line, which in my mind adds to her visual appeal. Hope that you enjoy watching the video. Having a balanced life is a key to happiness. Having a balanced rig is a key to happy sailing. Sailing a properly balanced rig is a wonderful experience. 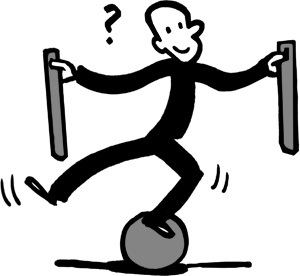 Holding a course becomes easy, steering is predictable, controlled and requires little effort. So, what is a balanced rig? Balance is the relationship between the center of effort in the sail and the center of lateral resistance in the keel, centerboard, or in this case leeboards. If you are not familiar with these terms, the center of effort is a site on the sail that represents the center of the total sail area. It is the spot that the sail pulls from when it is full of wind. The center of lateral resistance is the center of the leeboard surface area that is underwater. Since the leeboards are pivoted fore and aft, the center of lateral resistance can be moved fore and aft. This is where balancing comes in. Balancing the leeboards basically involves setting the angle of the leeboards so that the center of resistance lines up with the sails center of effort. If the leeboards are too far forward, the center of effort of the sail will be behind the leeboard’s center of resistance, causing the stern of the vessel to slide down wind. The result is that the boat will want to turn into the wind. A sailor at the helm refers to this unbalance as “weather helm”. On the other hand, If the leeboards are too far back, the center of effort of the sail will be forward of the leeboard’s center of resistance, causing the bow of the boat to be pulled downwind. A vessel having this downwind unbalance is said to have “lee helm”. A properly balanced rig will allow a non heeling craft to sail in a straight line with minimal input from the helmsman. A certain amount of steering can also be accomplished by changing the leeboard’s position. To steer upwind, the leeboard is moved forward. To steer down wind, the leeboard is moved aft. This is especially useful if a craft does not have a rudder or skeg. 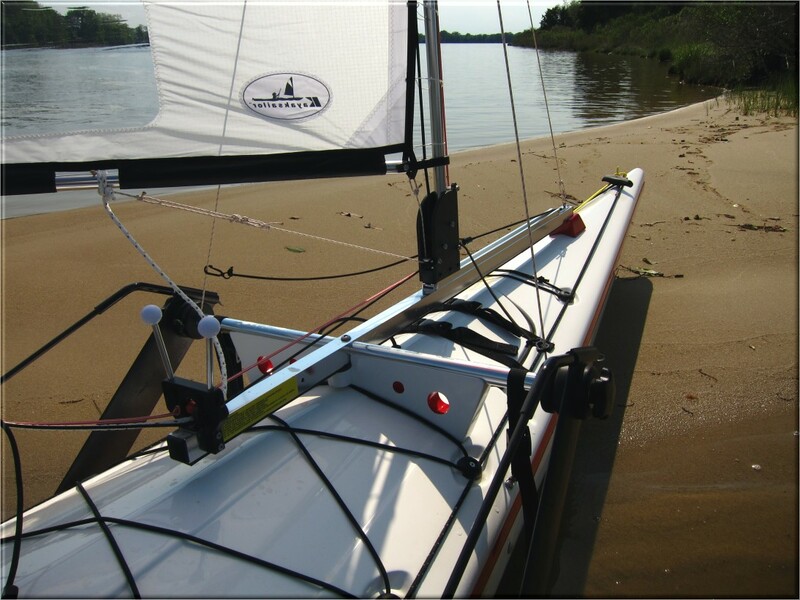 Leeboard steering is most effective when sailing on a beam reach (90 degrees to the wind) or on any reach closer to the wind, and least effective on reaches off the wind. 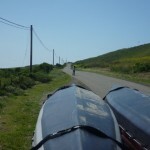 When running directly down wind, leeboard steering will not work at all. 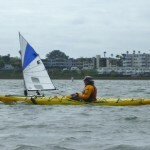 On the Kayaksailor, the balanced position occurs on most hulls when the leeboards are pivoted back about 25 degrees from vertical. 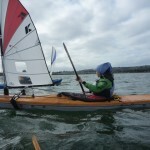 So, the next time you are out on the water, play with the leeboard position and try using the boards to help you steer. Most of all, find time to kayak-sail more often. Remember, balance is the key!